With just a few days left to run and already having achieved 1000% of its target, the Kickstarter for Black Orchestra‘s Conspirator Packs has been a runaway success, but who are the new conspirators and what do they bring to the game? We’ve been lucky enough to receive an early prototype of both packs and I’ve been feverishly testing them to bring you this brief mini review. I’m not going to cover features from the main game here in much detail, but when I reviewed it back in March, I remember mentioning how intense and exciting the game is. One to five players can develop their plans slowly and carefully or more recklessly, with push your luck mechanics and balance risk and reward very nicely. I did mention that the idea of a game built around an assassination might be slightly contentious, but since it’s Hitler, that never really bothered me. 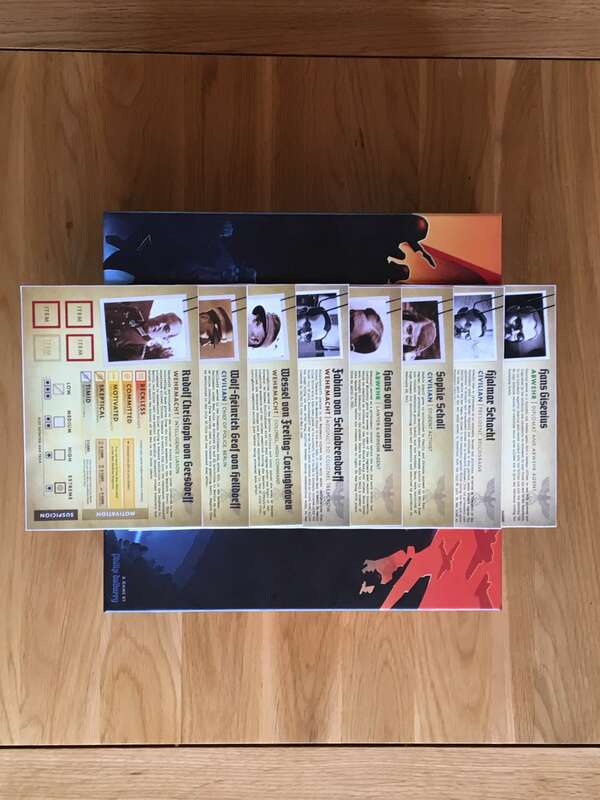 Between them, the two new Conspirator Packs add an additional eight player characters to the game, each of whom comes with their own special abilities depending on their level of motivation. Much as with the characters in the base game, the differences between each character are subtle, but nonetheless they do change the way you’ll want to approach the game, especially when specific mixes of characters are in play. 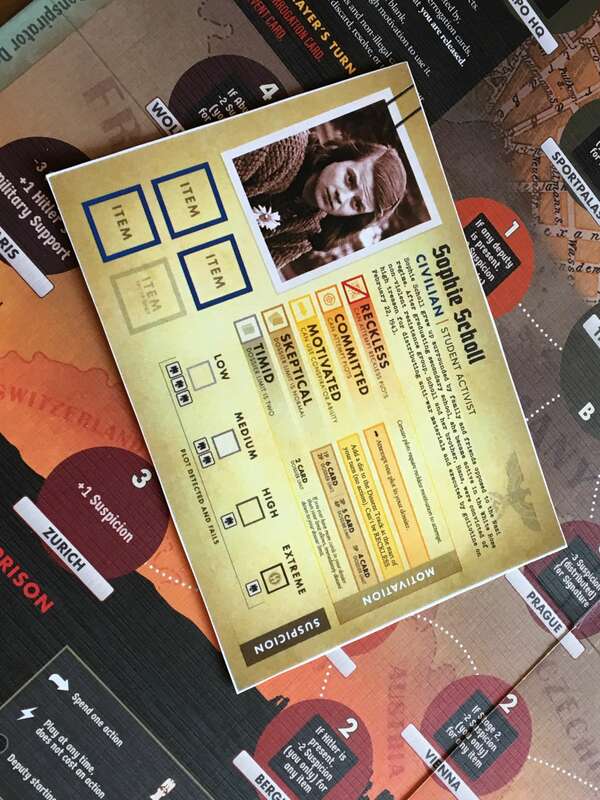 Included in the first Conspirator Pack (and by the way, the only reason that there are two packs is because the first one relates mostly to previously released conspirators) is the first female character in the game; Sophie Scholl. Scholl was a member of the White Rose resistance group and a real life heroine who was convicted of high treason and executed by Hitler’s regime in 1941. The injustice of her death makes the idea of being able to guide her to being involved in the demise of Hitler makes the game all the more thematic. That thematic link between the stories of real life people and the stories created in game are what make Black Orchestra so compelling and certainly, provide the main reason to invest in the Conspirator Packs. This expansion includes the eight new characters you can see in the image above (shhh, because some of them are still a secret) but it doesn’t include any other components or material changes to the game play of the base game. As such, it’s hard to give the Conspirator Packs expansion a specific verdict, because whether you’ll want it or not depends on your experience with the base game. I loved Black Orchestra and my friends often ask me to bring it back to the table, so having an additional eight characters to choose from is no small thing in terms of expanding replay potential. Since Black Orchestra is a great game for retelling history and creating those memorable stories of tabletop strife, the Conspirators Pack only enhances its ability to do so. If you’d like to back the Black Orchestra Conspirators Packs, you can do so via Kickstarter, here.